mama elephant | design blog: September STAMP WITH ME Winner! September STAMP WITH ME Winner! Hey, hey folks! I am posting this a day ahead of schedule because starting tomorrow this place will be jumpin'! We'll be kicking off our October Anniversary release festivities bright and early starting at 9:00AM EST. So excited! So, last month we challenged you to create SHAPED cards, you know, anything that isn't the standard square or rectangle -- a few of you took on the challenge and hit it out of the ball park! We love seeing how your imagination and creativity stretches using our products. Sharing your creativity is always a good thing! Ah, it was sooo difficult picking a winner, but this card by Anna Kossakovskaya really, really blew us away.. straight to the moon and back! Congratulations, Anna! Please email us at mamaelephant.winner@gmail.com! Here are some other fun entries that got us lookin' twice! We really adore THIS sweet card by francesca! The teeny sweater she drew on the bear is the best! 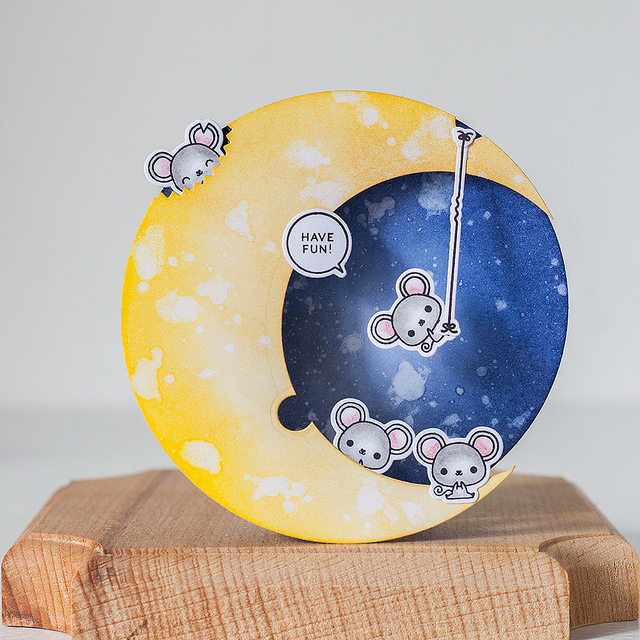 How fun is THIS cluster of circle cards by Laura Dovalo! Wham! Kim Hamilton knocked it out with THIS star shaped card! Thanks for sharing your creativity with us, ladies!!! The new challenge for the month of October is to create a BIRTHDAY card. Let's celebrate 3 years of Mama Elephant together! AWE what a very Adorable card!!!! Wow all cards are fabulous! ! Congrats Anna! I just love that card! Thank you for the mention! That is the greatest card I have ever seen! (I love mice). Yayyyy!! Congrats Anna!!! I love, love this card!! She soooo deserves this!! I love this card...the colors are so vibrant and deep. Great job. Congrats to Anna on her win! Such a darling design...I love it!